women that make up our military. Every Friday, every player on the Broadway (Broadway, Va.) football team walked into the locker room and saw the face of someone they would never meet staring back at them. However, those faces made a lasting impact on the players' lives. Broadway players and coaches wore metal bracelets with the names of fallen soldiers on them. A photograph along with information about a U.S. solider who died in Iraq hung in the locker room when the players arrived around 3 p.m.
Broadway coach Brad Lutz, who researched each soldier online at Legacy.com, told the athletes more about the soldiers at pregame meals. The soldiers' names were announced over the loudspeaker during games, and afterward Lutz wrote a message on each soldier's online condolence page. "It really means the world to me," senior receiver Nate Hooven said of the weekly tributes. "They gave all they have so we can do things like play the game of football. To give back to them is the greatest possible thing we can do." When Lutz started receiving e-mails from the families of the fallen soldiers, he realized that what started out as a program-building tribute had turned into so much more. "It made them [the team] understand that the families appreciated their tribute. It was an opportunity for them to know they did something good for somebody else," Lutz said. "It's rewarding for me as a coach to see that now our kids understand a small act can turn into something big and make a positive impact on so many people." Lutz, a first-time head coach whose father served in the Army, was looking for something to bring his team together and teach lessons that reach beyond the lines on a football field. "There are so many different characteristics of the military: loyalty, respect, honor. Those are things we're trying to build our program on," Lutz said. The team played in memory of soldiers who died on the date of that week's game, and no tribute meant more to Lutz than during Week 2. Clarence Adams III died on Sept. 7, 2004, of injuries received when his vehicle hit an explosive device in Baghdad. Adams was 28, the father of six and Lutz's high school teammate at Varina (Richmond, Va.). "When I lost my buddy in 2004 it really changed the way I think about things," Lutz said. "After he passed away I used football to keep his spirit alive, and now it's manifested into this season." Broadway defeated Fort Defiance 14-8 in Adams' honor, giving Lutz his first win as a head coach. "There wasn't many dry eyes in that postgame speech," Lutz said. "They [the team] wanted to win because we work hard, but I think for them to know that it was somebody who not only made the ultimate sacrifice, but also a teammate of mine -- it was easy to make that one personal." The tributes became personal for the players, too. Hooven keeps every photo and hangs them in his locker at school. Lutz laminates every e-mail response and keeps them in his office. 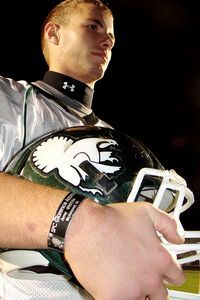 Coaches wear metal bracelets with the names of fallen soldiers on them, and the player-awarded linebacker of the week winner wore a metal bracelet as reward. We're playing for these guys, and they did something great for their country. Maybe if I do something great for my country and something not too great happens to me, maybe somebody will play for me someday. For senior fullback Sean Layman, the tributes reached home in a different way. Layman will enter the Marine Corps in July. During Week 8, Broadway played in memory of a fallen Marine. The following week, Layman read a letter from the Marine's girlfriend to his teammates. "It was all I could do to keep from crying," Layman said. "He was a young guy of 25. It was so hard to hear because she talked about her and her kid. It's hard to believe because that kid is going to have no father growing up. "We're playing for these guys, and they did something great for their country. Maybe if I do something great for my country and something not too great happens to me, maybe somebody will play for me someday." Broadway finished its season 5-5 and missed the Virginia playoffs, but Lutz said the tributes will continue next season. Lutz and his coaching staff will send game balls to every family of the fallen soldiers the team played for this season. "It's one of the most rewarding things I've ever been a part of," Lutz said. "What started off as a tribute has gotten real personal and helped us build some relationships with people we would have never met." Mike Loveday is an editor for ESPNRISE.com and can be reached at Michael.Loveday@espn.com.